If you have an android phone, you may have faced the problem “Screen overlay detected.” Do you want to fix this error? Well, Go through this article. In fact, There is no errorless phones or tabs. You will face some sort of problem with it. But, Some of them are very disturbing. Specially, If you have a Samsung smartphone, Screen overlay detected error may be very common for you. This article explains why it happens and how to fix this problem. Here, I’m explaining what causes this error. But, If you want to skip it, click here to go straight to the solutions to fix screen overlay detected. There may be several reasons. 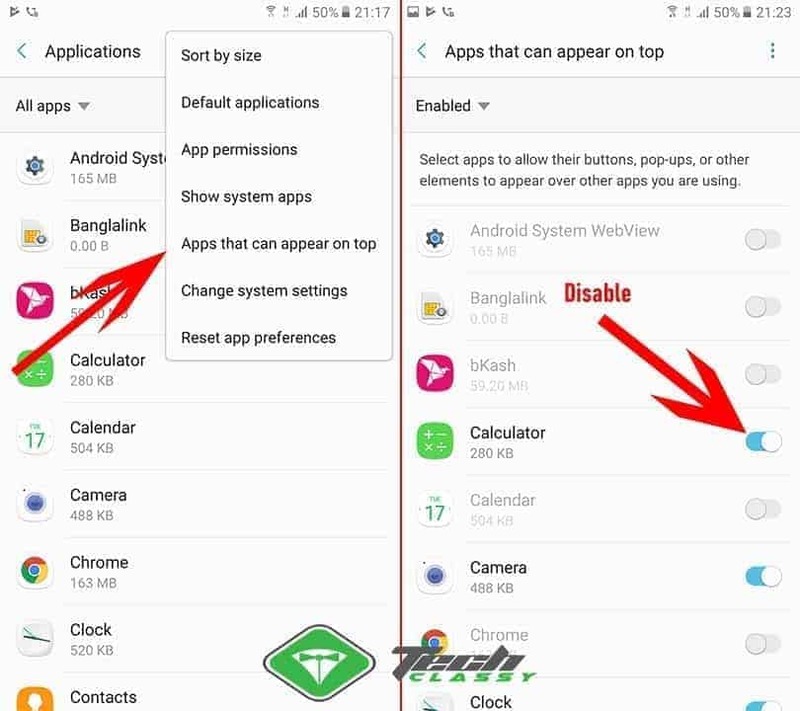 But, Most common issues are caused by some of the apps which run in the background like ES File Explorer, CleanMaster etc. Also, It can be a bug in your smartphone. In most cases, The Samsung and Motorola users face this problem more. 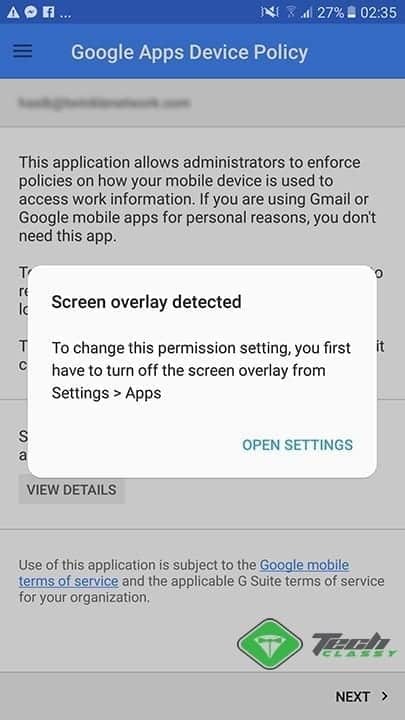 Screen overlay detected error also appears when your app has not all required permissions to run it smoothly. Whatever causes this problem is not a matter. You always have a way to get rid of it. As this problem appears more on Samsung, so, I’m focusing it more for the Samsung users. First of all, Go to Settings > Applications on your phone. Now, You will see the list of apps which has permissions to appear over the apps you use on your phone. You can tweak the switch to disable or enable this permission. Just disable the permissions for all apps and restart your phone. You are done. From now, You should not encounter the problem again. At first, Navigate to Settings > Apps. Now, Tap on the three vertical dots icon and choose “Draw over other apps” something similar to this. Then, You can disable the permission for all apps and restart your phone. It will fix screen overlay detected error. If you have stock android or if you are using Google Pixel phone, these steps may be more accurate for you. At first, Go to Settings and Apps. Now, Tap on the gear icon on the top and choose “Special Access” option. If you are using Android 8, You may need to go to Settings > Apps & Notifications > Advance > Special App Access. Then, Disable the permission for all apps. I hope it will solve the screen overlay detected problem. What if You Don’t Want to Disable the Permission for all Apps? It may happen. In this case, I suggest you to disable the draw over other apps permission for all apps. Then, Enable it one by one to see which one is causing the problem. Once, You find the culprit, you can uninstall the problematic app or keep it disabled from accessing that permission. Hopefully, These tips will help you to get rid of the screen overlay detected on android phone or tablet. If you have any question or suggestion, let me know in the comment box.